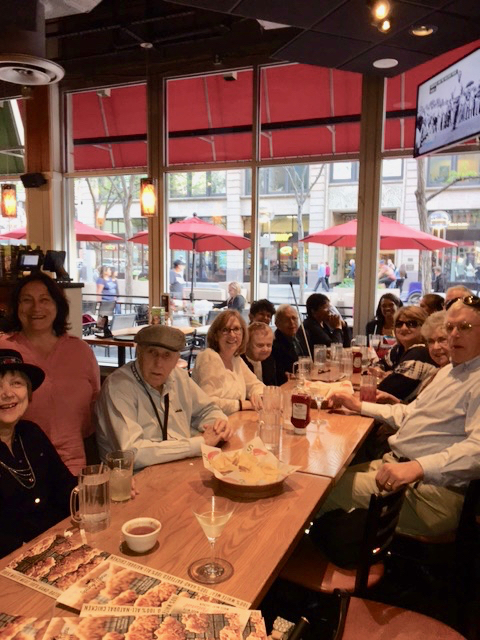 Here’s a pic of some of our seniors at Chili’s last Saturday, after attending the audio-described performance of “Mama Mia” at the Denver Center for the Performing Arts. The Seniors used it as a fund-raiser, raising over $200. They keep a small donation fund going to help out with the expenses of various Senior activities for those who may come up short – things like bowling or movies. The money raised will go into that pot. For the audio-described performances, blind and theater-goers check out a small FM receiver and headphones over which they receive the live audio description of action on the stage. DCPA offers at least one performance with this accessibility service, as well as sign-language interpreters, for each production.